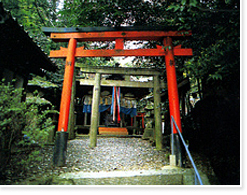 Shrine dedicated to the guardian god of Komyo Village. Ikutama-no-mikoto and other gods are enshrined here. Beside the main hall, big granite rock of about 6m circumference and 12m high named "Eboshi iwa" (literally, ceremonial hat rock) has been enshrined as an "Iwakura" (ceremonial place for the god to come down to this world). From Higashiikoma station of Kintetsu Nara line, take Narakotsu bus To Inakura stop.